Sure you've heard of folk art, but fork art? You read that right. This craft takes its lead from the environmentally "found art" movement dedicated to repurposing materials that might otherwise go into landfills. Whether you'd like to become a "master fork artist" like Matthew Bartik of Mariaville, NY, whose mission is to beautify the world one bent fork at a time, or you just want to surprise passersby with a touch of whimsy, follow some specific instructions to make individual lawn ornaments or an entire fork bouquet. Turn a fork into a piece of art. Visit secondhand stores and resale shops to buy up quantities of metal forks. Clean them before you start crafting your lawn ornaments by removing oil, debris and other soil with a non-residue agent such as Freon TF. Cut lengths of rebar or metal bar to predetermined lengths to create a series of stems for your lawn ornaments. Prepare a work area near an electrical outlet to ensure a power source for your soldering iron. 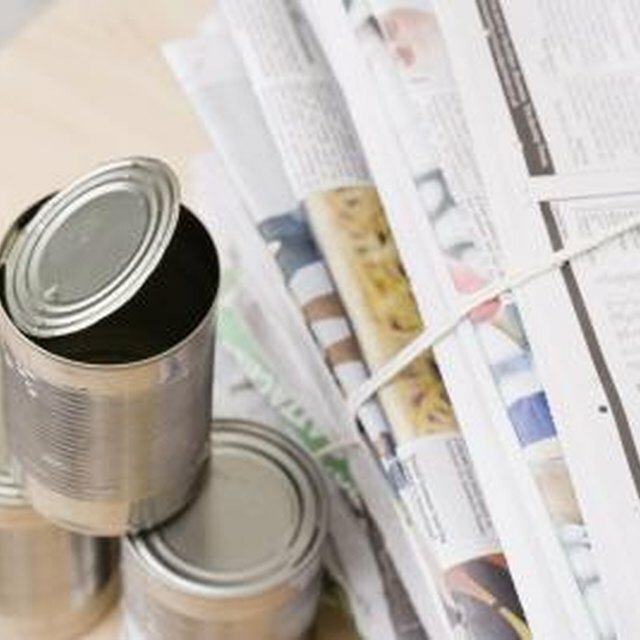 Use an electric can opener to cut circles from the tops of cans to make edges smooth and even. Select two metal circles of the same size to create the center of each flower. For example, two 6-inch coffee can tops work nicely. Arrange as many fork petals as you wish (handles facing inward) atop one can lid to create the shape of a flower. Set the soldering iron to between 25 and 40 watts, allow it to heat, then place a small sliver of solder on the iron so it begins to melt. Solder each fork to the center of the circle until you have connected all "petals." Place the second lid atop the circle of soldered forks, lining it up to match the edges of the bottom lid (it should look like a round sandwich with forks poking out between two lids). Allow time for each juncture to cool down and harden so you have a smooth, shiny connection at soldered sites. Continue to experiment with flower shapes, following the above steps until you have fabricated enough flowers to decorate your lawn. Use high-gloss, metal-friendly paints to decorate each ornamental flower, unless you prefer to leave the metal unpainted so it can develop a uniform patina courtesy of the sun. Put your quirky floral lawn ornaments on display by sinking stems into the soil of your yard individually or artfully arrange the blooms in a giant terracotta flowerpot topped with greenery to make a lawn statement guaranteed to be the talk of the neighborhood. Expect to spend between $15 and $50 for your soldering iron, depending upon wattage. Buy an all-purpose soldering agent that contains a small infusion of silver and "flux," an industrial agent that helps hot, liquid solder adhere to metal.